Blend all the ingredients together (except blackberries/boysenberries) until smooth. Heat a lightly buttered griddle or frying pan over medium heat. 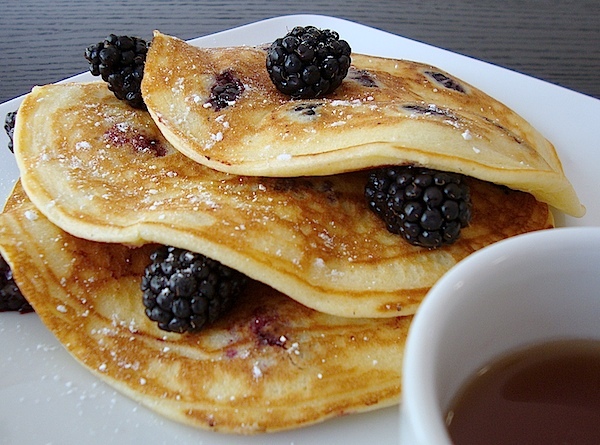 When griddle or pan is hot, pour a 1/4 cup of the batter into the griddle and scatter blackberries/boysenberries on top. Cook until bubbles appear on the surface (about 1 to 1 1/2 minutes). Flip over and cook a further 2 minutes or until golden brown. Remove and keep warm. Repeat with the rest of the batter and blackberries/boysenberries. Serve with maple syrup (warm). These look amazing Mia! Great post! Yes! Yes! and Yes! How tempting they look. Sound delicious, lemon with the blueberries, good team. Just came from Sawsan's blog, and it looks a very wonderful blog here with all of these mouthwatering goodies, thank you Mia. Thanks, Amee! See you Friday! What is Miso Paste Anyway, and How Do I Use It? Help! Food and Health Industry NOT Linked! Sweet And Toxic: Is Sugar Really 'Poison'? What Are We Really Eating? Get Real! - as in Real Food. This blog is a Fusion between Rustic Food and Modern Ideals. Mia shares original recipes and recent articles that support her beliefs. Organic, Non-GMO, Grass-Fed, Wild, Artisan, Pastured, Local, Gluten-Free, No-MSG, Paleo, etc. - are common topics being explored here. Check back often or follow her on Facebook to keep an eye on her latest blog posts and make sure to join in the conversation! As a young girl living on a small island in the South Pacific, Mia frequently visited her beloved grandma who lived in a tiny countryside village. Though her grandma only had a tiny kitchen with no refrigerator and a makeshift outdoor stove, she enjoyed cooking everything from scratch using fresh ingredients that she herself organically raised and farmed... with lots of love! Mia has long since sampled a wide variety of unique foods from around the world, but her inspiration, passion, and appreciation for REAL food still originates from her Grandma. Mia tries to source everything from local farms or farmers markets when possible, using mostly fresh, wild, pastured, or organic ingredients. Many thanks for visiting Mia's Domain. Be sure to visit often, enjoy...and spread the word! All recipes and their respective images on this blog are original and the sole property of Mia's Domain © 2011-2016, with all rights reserved. All content herein is meant for your personal enjoyment only and is in no way to be used for commercial purposes. Other than linking to a page, sharing on social media sites (with credit and links), or pinning an image on Pinterest, Mia asks that you do not copy or otherwise use these food images or original recipes for any other purpose without contacting her first and getting express written permission. Use of this site automatically constitutes your agreement to these terms. Slow Money: Is It Time to Slow Your Roll of Cash? Veggies: Let Your Child Choose! Could Bananas Be The Key To Longevity? Could Eating Out Be Boosting Obesity? Original Recipes and Food Images © 2011-2016, Mia's Domain™. Powered by Blogger.